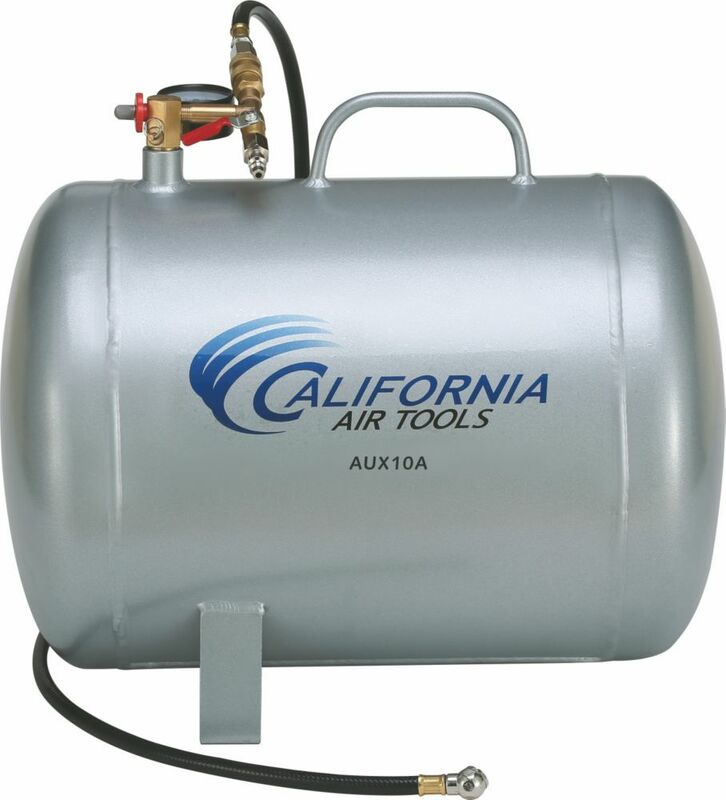 California Air Tools AUX10A - 10 Gallon Aluminum Auxiliary Air Tank is designed for portability and easy to use. The No Rust Aluminum Air Tank is lightweight and easy very easy to carry and transport. California Air Tools auxiliary air tanks are designed to provide an extra supply of air needed for short-term demands such as inflating tires. These auxiliary air tanks provide stable pressure and a constant air flow for purposes such as spray painting. Having the California Air Tools auxiliary air tanks will allow you to have an extra supply of air for more time before the air compressor motor/pump starts to run. The Easy to Use Quick Connect Fittings on the Air Hose and Air Valve allows you to quickly attach the Air Hose to an air compressor and fill the auxiliary air tank without needing extra air fittings. This Easy to Use Quick Connect System also allows you to connect a standard air hose to your air valve for use with air tools. The Hulk silent air compressors are designed to provide all power with little noise! The oil free, dual piston 2 cylinder pump with low amp draw and solid copper winding's allows for less wear and tear. These commercial grade pumps are designed with heavy gauge steel cylinders, cylinder head and valves for maximum durability and reliability. Providing 8.39 CFM @ 40 PSI and 5.77 @ 90 PSI and an amazing 36 DB @ 10 ft. , 41 DB @ 3 ft. away! The Hyundai HHC8QCC ultra quiet air compressor is an ideal choice for use at home and work. Unobtrusive during operation, the HHC Ultra Quiet series won't disturb or bother family or neighbours even in the dead of night. The HHC8QCC continues on the trusted functionality of the HHC series with an all new motor operating at the gentle sound level of 68dB the sound level of a conversation. The design also features many convenience considerations such as a quick access tool tray, storage pocket, angled control panel, ball-valve drainage, and a removable handle for easy transport and compact storage. In addition, it comes equipped with two hands-free air couplers that can easily support multiple users or allows you the convenience of two tools for a single user. A completely unique plastic casing and console protects the motor from accidental damage. For easier starting on cold days, and to eliminate the need for regular maintenance, the entire unit is oil-free. Industrial Air 113.5 L compressor, delivering 5.7 CFM at 90 psi, is designed for air tool performance. The 1.9 HP motor is wired for a 120V outlet but is also convertible to 240V applications. The compressor features a twin-cylinder pump made of cast iron and pre-attached pneumatic wheels for easy mobility. AUX10A - 10 Gallon Lightweight Portable Aluminum Air Tank California Air Tools AUX10A - 10 Gallon Aluminum Auxiliary Air Tank is designed for portability and easy to use. The No Rust Aluminum Air Tank is lightweight and easy very easy to carry and transport. California Air Tools auxiliary air tanks are designed to provide an extra supply of air needed for short-term demands such as inflating tires. These auxiliary air tanks provide stable pressure and a constant air flow for purposes such as spray painting. Having the California Air Tools auxiliary air tanks will allow you to have an extra supply of air for more time before the air compressor motor/pump starts to run. The Easy to Use Quick Connect Fittings on the Air Hose and Air Valve allows you to quickly attach the Air Hose to an air compressor and fill the auxiliary air tank without needing extra air fittings. This Easy to Use Quick Connect System also allows you to connect a standard air hose to your air valve for use with air tools. AUX10A - 10 Gallon Lightweight Portable Aluminum Air Tank is rated 4.1 out of 5 by 18. Rated 1 out of 5 by MIKEH from It is a nice tank and it is aluminum so that's nice, but when I filled it the first time it leake... It is a nice tank and it is aluminum so that's nice, but when I filled it the first time it leaked down to zero air within 6 hours. not a tank I can depend on, on the road, camping with the quads etc. and yes all the valves are turned off and you can’t find the leak with soap water and I have no way of checking the welds on the tank that would assure if the leak was there or elsewhere. Otherwise a nice-looking tank appears rugged but that don't get the job done. so, for now it’s back to the battery-operated pump and the old rusty iron small tank. Rated 5 out of 5 by William from Nice tank, much lighter than my old steel one. No... Nice tank, much lighter than my old steel one. No leaks, several fittings provided is a nice feature. Rated 4 out of 5 by modifieddriver from The tank itself is lightweight, which makes it easy to handle. The hose that comes with it, has a... The tank itself is lightweight, which makes it easy to handle. The hose that comes with it, has an air chuck on it, for inflating tires, which is primarily what I use the tank for. What concerns me, however, is that the fittings on the tank, that you might use to tap in with other air tools, are NOT equipped with NPT threads. They appear to be some sort of undersized, possibly metric threads, which might make attaching other hoses a problem. Rated 5 out of 5 by ss from Very light weight. Easy to fill and use. Very light weight. Easy to fill and use. Rated 4 out of 5 by farmer from For transporting but not for storage. Lightweight tank. Great for transporting air, but not suitable for storage air. Next day the tank is empty. The fittings are leaking. Rated 4 out of 5 by HomeDepotCustomer from Nice lightweight tank. The hose and fittings are OK... Nice lightweight tank. The hose and fittings are OK quality but I changed mine out for a proper cutoff valve. Rated 5 out of 5 by Garry from I love this thing! Having read other reviews, I expected I would have to re-seal a bunch of fitt... I love this thing! Having read other reviews, I expected I would have to re-seal a bunch of fittings when I received it, but right out of the box this one doesn't leak at all. It is significantly lighter than my old steel tank, and I don't have to worry about the inside rusting out, because it's aluminum. The fittings make it simple to refill; just quick-connect the compressor hose, open the valve, and it fills. Highly recommend!